Warrant from Treasurer Danby to the Customs Commissioners to permit the following ships, bound for Virginia with his Majesty's soldiers and stores, to pass, notwithstanding the embarge or stop lately directed : also to suffer the stores sent from the Office of Ordnance for the King's service at Virginia to go out customs free, viz., the ships Henry and Anne, Barnaby, Francis, William and Robert, Golden Lion, Recovery, Merchant's Consent and Constant. Out Letters (Customs) III. p. 240. Same from same to same "to establish the [Customs] surveyors in the Plantations [viz.] surveyors and comptrollers." Ibid. Warrant from Treasurer Danby to the Customs Commissioners for Christopher Rousby to be collector of the new Plantation duty in Maryland, loco Charles Calvert, now Lord Baltimore. Thomas Miller same in Albemarle county in Carolina, and the creeks and rivulets thereto belonging or adjacent. Out Letters (Customs) III. p. 241. Royal warrant to the Attorney or Solicitor General for a great seal for a grant of the yearly annuity or pension of 100l. to Peter D'Avaux (D'avaux), picture drawer in minateur : during pleasure ; out of the Exchequer half yearly ; to commence from Michaelmas last. (Treasurer Danby's subscription dated Dec. 6 of docquet hereof). King's Warrant Book V. p. 237. Docquet Book, p. 104. Same to same for a same for a grant to John Shales, Esq., of the office of one of the Auditors of Crown revenue in reversion after St. Joseph Seymour, John Phillips, Richard Aldworth, Anthony Parsons, Humphrey Morrice, or Richard Lightfoot : for life : with 200l. per an. and all other fees, diets, profits, etc. : (said 200l. to be in satisfaction of the allowances formerly made to said Auditors in the accompts of the several Receivers of Crown Revenues "and of all other fees and profits and advantages to the said office belonging") (Treasurer Danby's subscription dated Dec. 2 of docquet hereof.) King's Warrant Book V. p. 237. Docquet Book, p. 102. 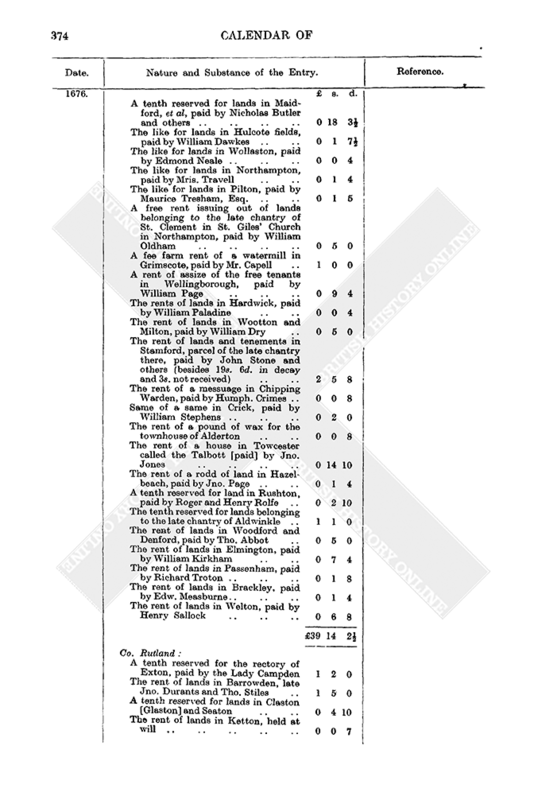 Same to Treasurer Danby to contract (or to give warrant to the Trustees for Fee Farms to contract) with Sir William Hayward, Kt., or his nominees, for the rents as in the schedule below ; at 16 years' purchase with rebate of interest as usual : to be conveyed to said Haward and his or their heirs in such manner as has been used : all notwithstanding any former order or warrant [restricting the sale of any such rents]. Appending : Said schedule King's Warrant Book V. pp. 238-40. Warrant from Freasurer Danby to the King's Remembrancer to stay process against Michael Arnold and William Dent, as sureties for Robert Stockdale, late collector of customs at Dover, upon their withdrawing their pleas and confessing judgment upon their surety bonds, they having proposed to pay 500l. each on their said bonds within a month and to give new security for the remainder of the debt which shall appear due from said Stockdale on the stating of his accompt. Warrants not Relating to Money VII, p. 8. 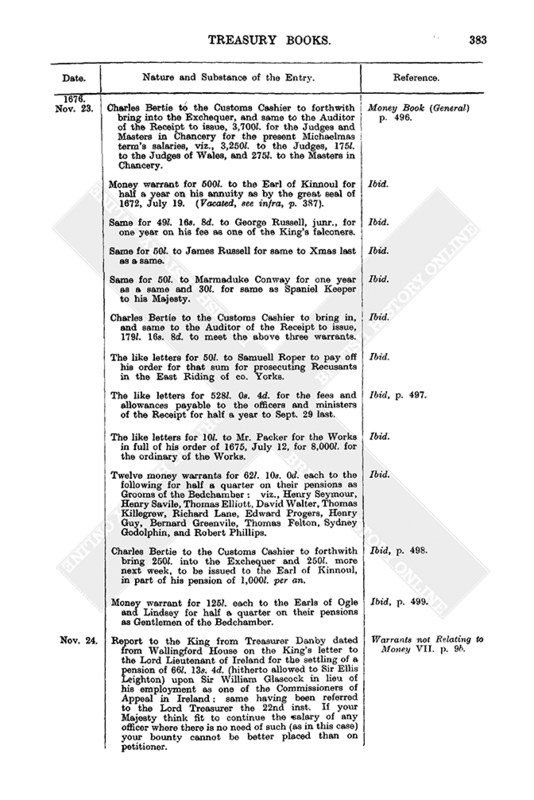 Charles Bertie to [Alderman Backwell] to pay Col. Rumsey's tally of 200l. out of the moneys of the Queen's portion in your hands. Money Book (General) p. 504. Same to the Auditor of the Receipt to pay 45l. to Sir Edm. Sawyer, Kt., for 2 year's arrear to Lady day last on his fee of 20l. per an., payable out of the Receipt. Ibid, p. 493. Money warrant for 455l. to Sir Richard Bulsbrode for six months' ordinary to Oct. 18 last as Resident with the Government of the Spanish Netherlands : it being certified by Secretary Coventry that said Bulstrode kissed hands the 19 Jan. last upon his departure to the said employment. Ibid. Six same for 50l. each to Mris. Anne Walker, Mris. Anne Howard, Mris. Cary Frazier, Mris. Frances Skeldon, Mris. Cecilia Swann, and Mris. Phillippa Temple ; for one quarter on their pensions as Maids of Honour to the Queen. Ibid, p. 494. Nine same for 75l. each to the following for same as nine of her Majesty's Dressers, viz., Mris. Orpe, Mris. Windham, Mris. Cranmer, Madame de Borde, Lady Tuke, Lady Frazier, Lady Killegrew, Lady Clinton and Mris. Crane. Ibid. Col. Mansells desires that he may be heard on behalf of Capt. Sandys before the Earl of Oxford be paid his 1676 Christmas quarter on said Earl's pension : [said Sandys] having an assignment for 100l. upon that quarter. Caveat Book, p. 22. Warrant from Treasurer Danby to the Customs Cashier to pay to the Customs officers of the outports a half year's salaries to 1675, Michaelmas. (Charles Bertie to said cashier to pay one quarter upon the said warrant). Money Book (General) p. 494. Treasurer Danby's approval of the instructions drawn up by the Customs Commissioners (dated June, 1676, and addressed to Edward Backwell, Comptroller of Customs inwards and outwards London port) relating to the business of the comptrol of said port. Same is to commence from Sept. 29 last, and Backwell is to transmit to the Treasury weekly duplicates of the certificates as below. Prefixing : Said instructions. To the end we may have a constant weekly account of receipts and payments in London port and of bonds remaining unpaid in whole or part, you are to have a key of the chest in which are lodged all bonds for the additional duty or new impost, and said bonds are to be lodged there till payment, and if taken out in your presence for part payments to be endorsed on them, they are to be put back again and the moneys so endorsed are to be by you charged upon the account of the collector. If any bonds be not so endorsed and not put back into the chest, you are to charge them as money to the collector. To the end there may be a complete cheque or comptrol upon the payments as well as the receipts of the customs you are to have from time to time a view of all debentures for corn exported, and for foreign imported goods shipped out by certificate, after the payment of such debentures, and of all moneys paid to the Receiver General. You are to signify your cognisance of such debentures by signing the same. On Wednesday in every week at 8 o'clock in the morning you are to transmit to us a certificate containing an account of the [receipts of the] customs and other duties inwards and outwards, distinguished according to the several receipts, how much in money, how much in bonds, and what remains due on bonds in the chest ; and likewise of the payments by any Receiver either to the Cashier General or for debentures for the week ending the Saturday before. Out Letters (Customs) III. pp. 242 4. Warrant from Treasurer Danby to Sir Joseph Seymour, Auditor for co. Worcester. On the grant of the manor and park of Feckenham to Sir Thomas Leighton and Dame Elizabeth, his wife, in fee farm by Queen Elizabeth, the said Queen and her heirs were out of the fee farm reserved by said grant to discharge the said fee farmers of the sum of 20l. 14s. 3d. per an. for the fees of the Ranger and keepers of the forest and park of Feckenham, and the woods thereto belonging. Same has accordingly been deducted by the fee farmer out of his rent ever since. Said forest has long since been de-afforested and the park dis-parked, whereby said officers have been discontinued, wherefore said 20l. 14s. 3d. per an. and the arrears thereof from the Restoration ought to be accompted for to the King up to the time said fee farm was lately purchased [outright]. George Lea, a collector of certain of the King's rents in co. Worcester, has lately levied and received of Lord Coventry the present fee farmer of the manor and park of Feckenham the said yearly sum of 20l. 14s. 3d., and the arrears thereof from the Restoration or a great part thereof, and has not accompted for same. He is hereby ordered with all speed before the end of the present Michaelmas term to appear before you and accompt for same and to pay what is due upon his accompt to the Receiver of the county. You are to take care hereof and advertise me herein that he may be sent for by a messenger if he delay. Warrants not Relating to Money VII. p. 9. Warrant from Treasurer Danby to the Barons of the Exchequer to take the securities of George Moore as Searcher of Hull port, loco Charles Whittington, deceased : said securities being himself, Richard Hutchinson, of St. Giles in the Fields, gent., and William Moore of London, gent. Warrants not Relating to Money VII. p. 9. 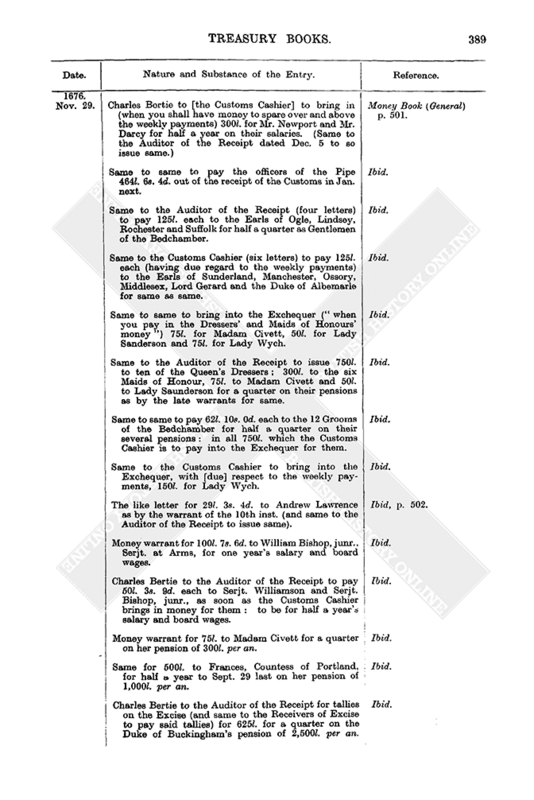 Charles Bertie to [the Auditor of the Receipt] to satisfy the order already drawn for a quarter on the Earl of Sussex's pension out of Excise moneys already brought into the Exchequer, "and that you likewise pay his quarter due at Michaelmas last out of the next money to be paid in for that purpose." Money Book (General) p. 494. Money warrant for 5l. to Elizabeth Pinckney as royal bounty. Ibid. Same for 274l. 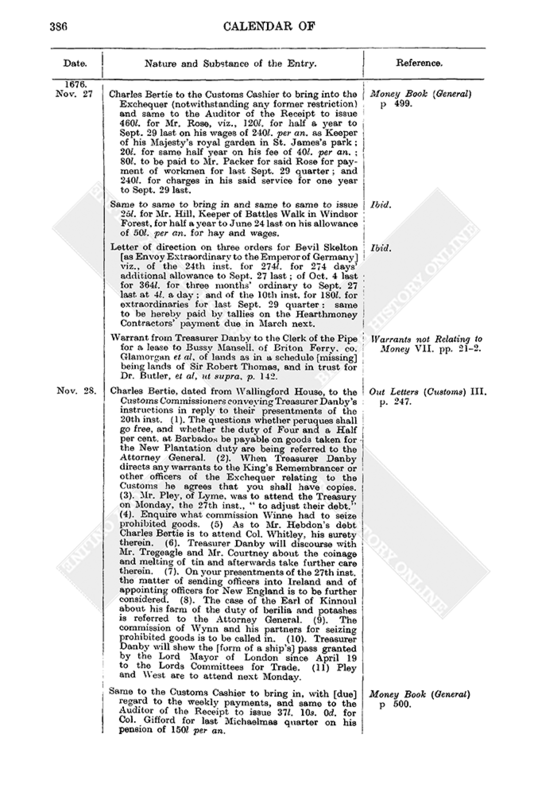 to Bevil Skelton for 274 days from Dec. 29 last on his additional allowance of 1l. a day from that date as Envoy Extraordinary to the Emperor of Germany, ut supra, p. 372, over and above the 4l. a day ordered him by the privy seal of Dec. 15th last : "it appearing since to his Majesty" that Envoys Extraordinary to the Emperor have usually been allowed 5l. a day. Ibid. Letter of direction on an order dated Oct. 21 for 1,300l. to Sir Leoline Jenkins for a quarter's ordinary to Dec. 10 next : same to be hereby paid by tallies on the Hearthmoney Contractors' payment due in March next. Ibid, p. 495. Money warrant for 15l. to the sub-chanter of Lichfield Cathedral for one year to Sept. 29 last, on the perpetuity to the sub-chanter and vicars choral there. Ibid. Same for 10l. to the Dean of Lichfield for one year to Midsummer last on the perpetuity to the Dean and Chapter there. Ibid. Treasurer Danby's subscription of a docquet dated Nov. of a grant to Horatio Moore, Esq., of the Tennis Court lately built by Thomas Cooke, Esq., near the Cockpit and the profits thereof : to hold for his life from and after the death of said Cooke or the end or determination of the 21 years' lease thereof lately granted by the King to Charles Cornwallis, Esq., since deceased : which [ever of these two] shall last happen : all under the yearly rent of 6s. 8d. : and also a grant to said Moore of the office of Master of his Majesty's Tennis Courts at Hampton Court and elsewhere, built and to be built (except the said Court granted to the said Charles Cornwallis and such as shall be built at or near the Castle of Windsor by John Hall, Esq., and said Thomas Cooke, or either of them) : to hold same for life from the death of said Cooke and with the several fees of 8d. a day and 120l. per an. out of the Exchequer. Docquet Book, p. 100. Warrant from Treasurer Danby to the King's Remembrancer to release from custody and to stay process against Robert Stockdale, collector of Customs, Dover, who is far indebted to the King thereon, is arrested and in the custody of the Marshal of the King's Bench prison : his sureties being sufficient for his debt and having consented to his enlargement, and the Customs Commissioners having represented his industrious and faithful services in his said post. Warrants not Relating to Money VII. p. 9. Treasurer Danby's signature of a docquet of demise, by in custodiam lease under the Exchequer seal, to Sarah Hele, spinster, of a messuage and 140 acres of land co. Devon, parcel of the messuage and [tenement of Nich. Slanning, outlaw : at the rent of 4s. 2d. per an. and fine of 8s. 4d. per an. Ibid, p. 9b. Same of same of the transcript of the assignment of Sir Robert Thomas's estate to Oliver Hele from the King. Ibid. Royal warrant for a privy seal for 1,000l. to William Goulston, gent. : to be paid out of Visct. Yarmouth's wood farm rent due after Lady day, 1677. (Treasurer Danby's subscription dated Nov. 27 of docquet hereof. The docquet states the payment to be to said Goulston for Visct. Yarmouth and at the nomination of said Visct.) King's Warrant Book V. p. 241. Docquet Book, p. 100. Same to the Attorney or Solicitor General for a privy seal for a grant to Mary Fowles, widow, of the fines and penalties imposed in the King's Bench on the 10th Nov. inst. upon Sir William Petty, Kt., James Mountaine alias Godfrey, Patrick Lavallin, James Waller and Maurice Carrell for a riot and assault committed the 20th of Mar. 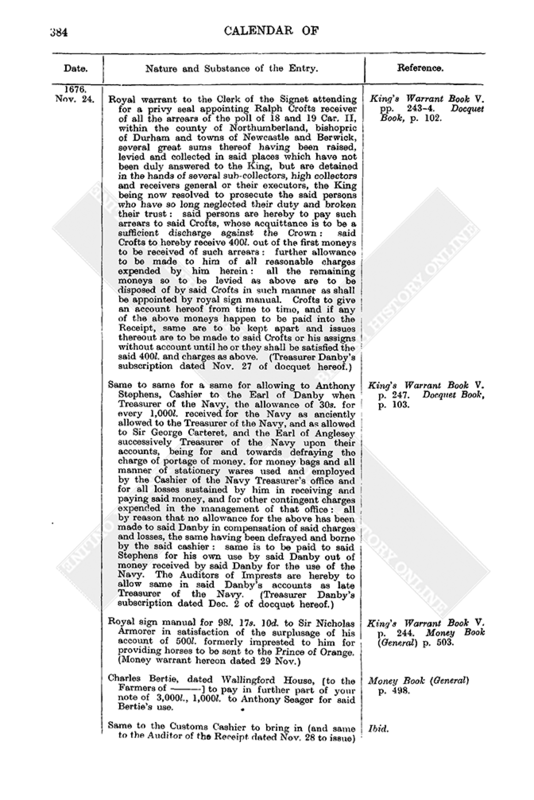 last upon Edward Vernon, Esq., and Henry James, his servant : viz., of 100l. fine on said Petty and 40l. each on the others as above : and further of the recognisance of 40l. each taken from said Petty and Waller before Sir Richard Ra[y]nsford, as Justice of the King's Bench, April 4 last for the appearance of the abovesaid at the return of the postea if upon the trial of the information of said riot they should be convicted : which recognisance is forfeit to the Crown. 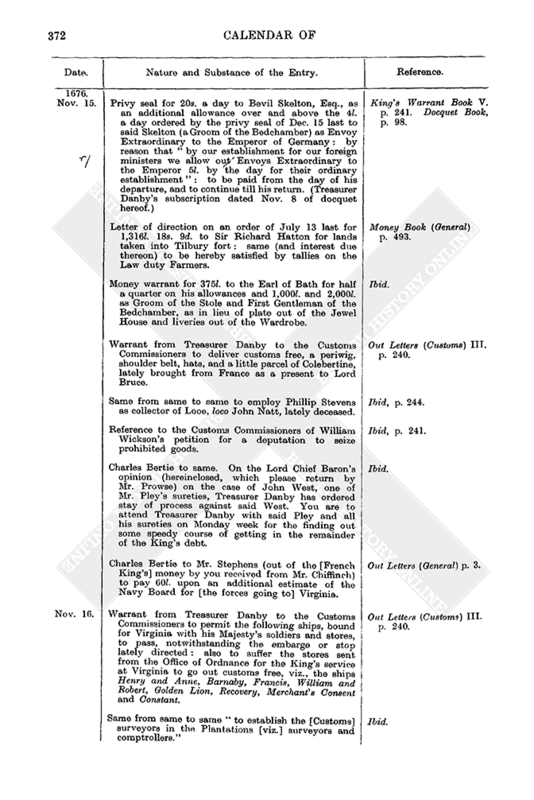 (Treasurer Danby's subscription dated Dec. 11 of docquet hereof.) 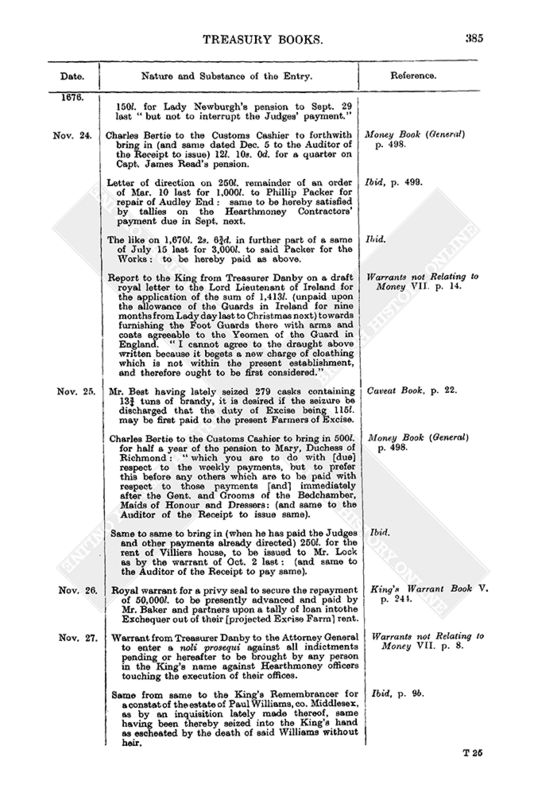 King's Warrant Book V. p. 242. Docquet Book p. 104. Reference to the Customs Commissioners of Christopher Seaward's petition for seven chests of Gally tiles lately arrived from Rotterdam in the John and Thomas and the Katherine. Out Letters (Customs) III. p. 244. 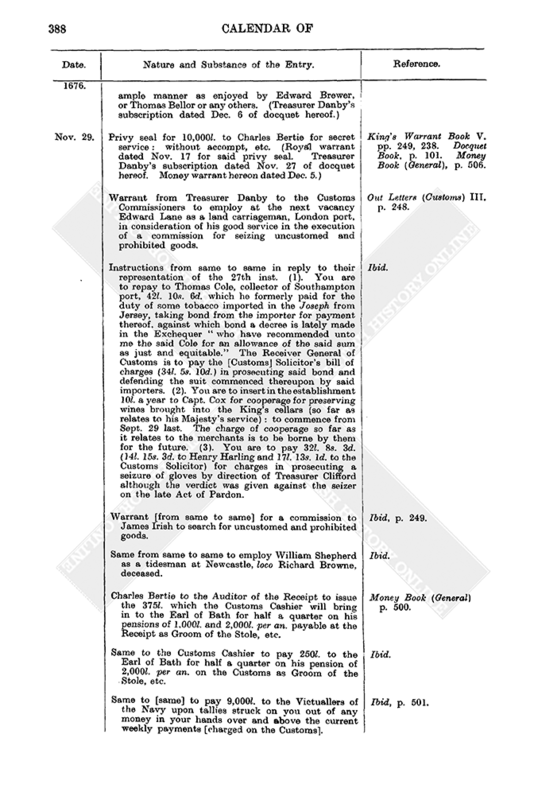 Charles Bertie to same to choose some other in the place of Hugh Chudleigh (one of the Surveyors of London port) to go to Ireland, said Chudleigh having applied to Treasurer Danby herein. Ibid. Warrant from Treasurer Danby to same or to the Attorney General to deliver to Robert Tipp the 60l. 13s. 0d. which his son John Tipp went away with, ut supra, p. 361. Ibid, p. 245. Same from same to the Customs Commissioners to employ Randolph for seizing prohibited and uncustomed goods. Ibid, p. 246. Warrant dormant from Treasurer Danby to the Customs Cashier to pay 200l. per an. to the Auditors of Imprests and 100l. per an. to their clerks for their pains in stating the general accompts of the Customs in all the ports : the first year to be that ended 1675, Sept. 29. Money Book (General) p. 495. Warrant from same to same to pay 12l. 10s. 0d. 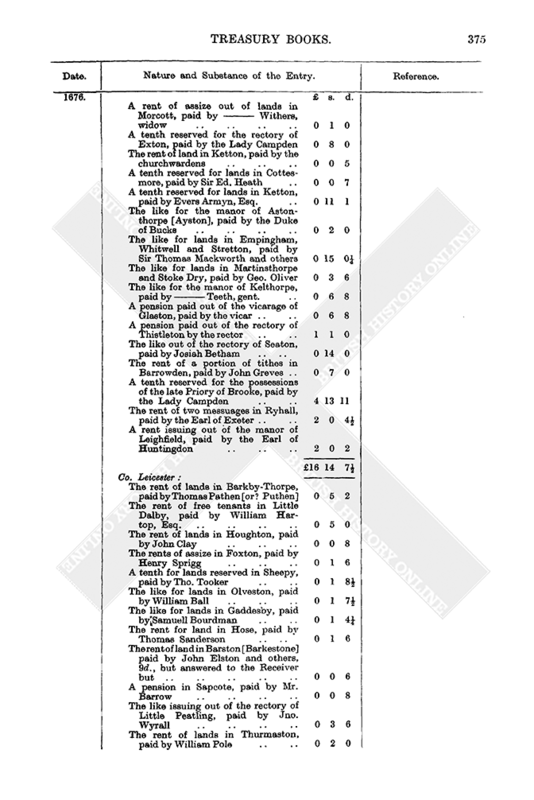 each to Daniell Collwall and Thomas Burton, gent., two of the undersearchers London port for one year to Sept. 29 on their salaries. Ibid. Same from same to the Receipt for issues to be made upon the copy of an order of 1675, Nov. 15, for 150l. to Isaac Legouch for a jewel for Monsieur de la Thanne, Envoy from the Duke of Brunswick : the original of said order having been lost, as appears by certificate from Mr. Burges and by said Legouch's affidavit before Baron Spelman. Ibid. Letter of direction on 3,500l. in part of an order dated July 15 last for 7,000l. to Philip Packer for one year's ordinary of the Works from April 1 last : same to be hereby satisfied by tallies on the Hearthmoney Contractors' payment due in Sept. next. Ibid. Treasurer Danby's subscription of a docquet of a demise to Sir Richard Lloyd of divers lands and tenements of William Batte, Alexander Butterworth, Edward Copley and John Smith in cos. Yorks, Lancs, and Chester, extended for debt : all at the rent of 9l. 2s. 1d. and fine of 18l. 4s. 2d. Warrants not Relating to Money VII, p. 9b. Warrant from Treasurer Danby to the [Customs] Commissioners to send away by this night's post to the officers of the customs in every port of the kingdom a printed copy of the late ordinance of the King of France for the quiet passing and trading of the ships belonging to England, Scotland and Ireland, for which purpose you will receive a sufficient number by the bearer of the said printed copies. One copy is to be affixed in some public place at the Custom House [London]. Out Letters (Customs) III. p. 245. Same from same to same to deliver to John Cholmeley, of London, on payment of Customs, some Roman fans, gloves and two or three pictures sent for small tokens from Mr. Herbert in Italy to his mother, the Countess of Pembroke, his aunt, the Countess of Feversham, his sisters and other relations. Ibid, p. 246. Reference to same of the petition of Sir John Frederick and company desiring leave to ship for Cadiz a case of ribbons brought by them from the Straits to London, which was consigned to Cadiz, where they were not permitted to land, it [the ship] being denied pratique. Ibid. Treasurer Danby to same in reply to their presentments of the 20th inst. You can allow 16l. to John Pett, boatman at Plymouth, for his charges in prosecuting a wherry which was publicly burned there, and in defending the vexatious actions of the proprietors thereupon. The business of the importation of foreign wire is to be left to the decision of a trial at law before I give any further direction therein. Ibid. Charles Bertie to the Customs Cashier to forthwith bring into the Exchequer, and same to the Auditor of the Receipt to issue, 3,700l. for the Judges and Masters in Chancery for the present Michaelmas term's salaries, viz., 3,250l. to the Judges, 175l. to the Judges of Wales, and 275l. to the Masters in Chancery. Money Book (General) p. 496. Money warrant for 500l. to the Earl of Kinnoul for half a year on his annuity as by the great seal of 1672, July 19. (Vacated, see infra, p. 387). Ibid. Same for 49l. 16s. 8d. to George Russell, junr., for one year on his fee as one of the King's falconers. Ibid. Same for 50l. to James Russell for same to Xmas last as a same. Ibid. Same for 50l. to Marmaduke Conway for one year as a same and 30l. for same as Spaniel Keeper to his Majesty. Ibid. Charles Bertie to the Customs Cashier to bring in, and same to the Auditor of the Receipt to issue, 179l. 16s. 8d. to meet the above three warrants. Ibid. The like letters for 50l. to Samuell Roper to pay off his order for that sum for prosecuting Recusants in the East Riding of co. Yorks. Ibid. The like letters for 528l. 0s. 4d. for the fees and allowances payable to the officers and ministers of the Receipt for half a year to Sept. 29 last. Ibid, p. 497. The like letters for 10l. to Mr. Packer for the Works in full of his order of 1675, July 12, for 8,000l. for the ordinary of the Works. Ibid. Twelve money warrants for 62l. 10s. 0d. each to the following for half a quarter on their pensions as Grooms of the Bedchamber : viz., Henry Seymour, Henry Savile, Thomas Elliott, David Walter, Thomas Killegrew, Richard Lane, Edward Progers, Henry Guy, Bernard Greenvile, Thomas Felton, Sydney Godolphin, and Robert Phillips. Ibid. Charles Bertie to the Customs Cashier to forthwith bring 250l. into the Exchequer and 250l. more next week, to be issued to the Earl of Kinnoul, in part of his pension of 1,000l. per an. Ibid, p. 498. Money warrant for 125l. each to the Earls of Ogle and Lindsey for half a quarter on their pensions as Gentlemen of the Bedchamber. Ibid, p. 499. Report to the King from Treasurer Danby dated from Wallingford House on the King's letter to the Lord Lieutenant of Ireland for the settling of a pension of 66l. 13s. 4d. (hitherto allowed to Sir Ellis Leighton) upon Sir William Glascock in lieu of his employment as one of the Commissioners of Appeal in Ireland : same having been referred to the Lord Treasurer the 22nd inst. If your Majesty think fit to continue the salary of any officer where there is no need of such (as in this case) your bounty cannot be better placed than on petitioner. Warrants not Relating to Money VII. p. 9b. Royal warrant to the Clerk of the Signet attending for a privy seal appointing Ralph Crofts receiver of all the arrears of the poll of 18 and 19 Car. 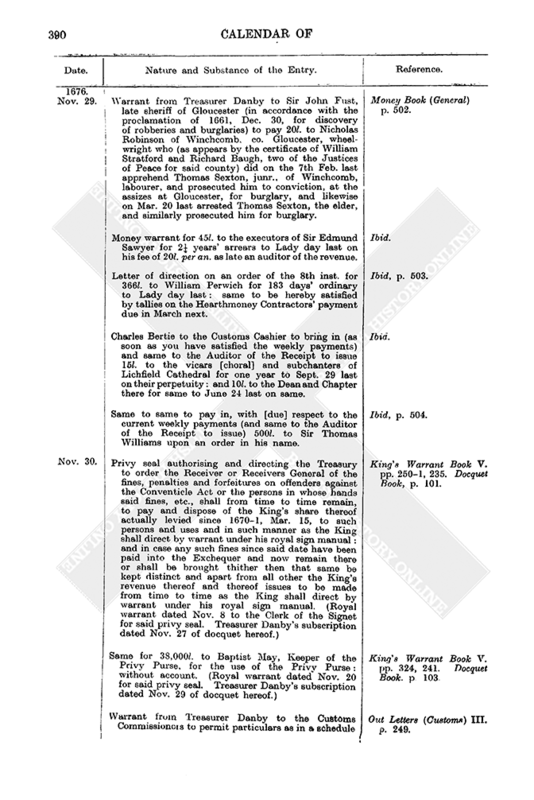 II, within the county of Northumberland, bishopric of Durham and towns of Newcastle and Berwick, several great sums thereof having been raised, levied and collected in said places which have not been duly answered to the King, but are detained in the hands of several sub-collectors, high collectors and receivers general or their executors, the King being now resolved to prosecute the said persons who have so long neglected their duty and broken their trust : said persons are hereby to pay such arrears to said Crofts, whose acquittance is to be a sufficient discharge against the Crown : said Crofts to hereby receive 400l. 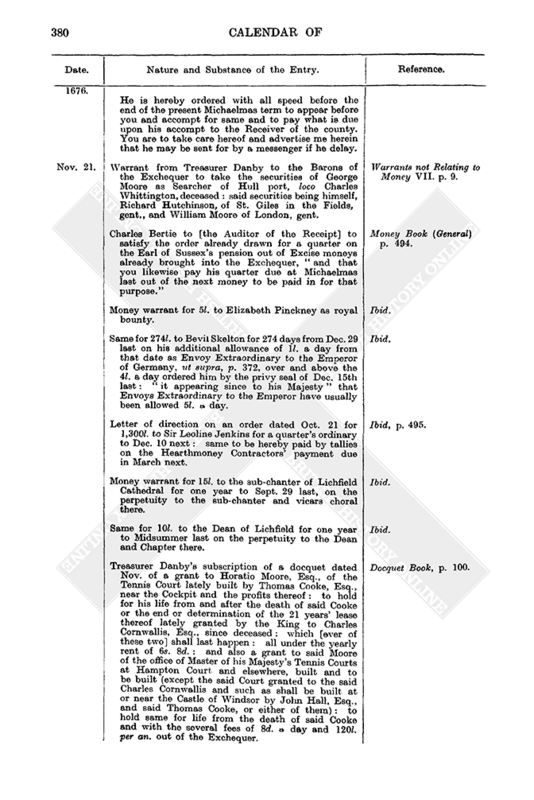 out of the first moneys to be received of such arrears : further allowance to be made to him of all reasonable charges expended by him herein : all the remaining moneys so to be levied as above are to be disposed of by said Crofts in such manner as shall be appointed by royal sign manual. Crofts to give an account hereof from time to time, and if any of the above moneys happen to be paid into the Receipt, same are to be kept apart and issues thereout are to be made to said Crofts or his assigns without account until he or they shall be satisfied the said 400l. and charges as above. 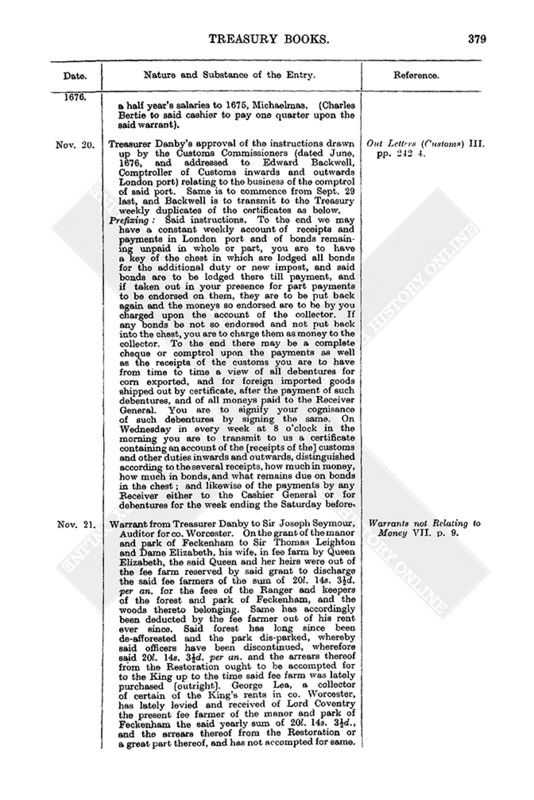 (Treasurer Danby's subscription dated Nov. 27 of docquet hereof.) King's Warrant Book V. pp. 243-4. Docquet Book, p. 102. Same to same for a same for allowing to Anthony Stephens, Cashier to the Earl of Danby when Treasurer of the Navy, the allowance of 30s. for every 1,000l. received for the Navy as anciently allowed to the Treasurer of the Navy, and as allowed to Sir George Carteret, and the Earl of Anglesey successively Treasurer of the Navy upon their accounts, being for and towards defraying the charge of portage of money, for money bags and all manner of stationery wares used and employed by the Cashier of the Navy Treasurer's office and for all losses sustained by him in receiving and paying said money, and for other contingent charges expended in the management of that office : all by reason that no allowance for the above has been made to said Danby in compensation of said charges and losses, the same having been defrayed and borne by the said cashier : same is to be paid to said Stephens for his own use by said Danby out of money received by said Danby for the use of the Navy. The Auditors of Imprests are hereby to allow same in said Danby's accounts as late Treasurer of the Navy. (Treasurer Danby's subscription dated Dec. 2 of docquet hereof.) King's Warrant Book V. p. 247. Docquet Book, p. 103. Royal sign manual for 98l. 17s. 10d. to Sir Nicholas Armorer in satisfaction of the surplusage of his account of 500l. formerly imprested to him for providing horses to be sent to the Prince of Orange. (Money warrant hereon dated 29 Nov.) King's Warrant Book V. p. 244. Money Book. (General) p. 503. Charles Bertie, dated Wallingford House, [to the Farmers of ] to pay in further part of your note of 3,000l., 1,000l. to Anthony Seager for said Bertie's use. Money Book (General) p. 498. Same to the Customs Cashier to bring in (and same to the Auditor of the Receipt dated Nov. 28 to issue) 150l. for Lady Newburgh's pension to Sept. 29 last "but not to interrupt the Judges' payment." Ibid. Charles Bertie to the Customs Cashier to forthwith bring in (and same dated Dec. 5 to the Auditor of the Receipt to issue) 12l. 10s. 0d. for a quarter on Capt. James Read's pension. Money Book (General) p. 498. Letter of direction on 250l. remainder of an order of Mar. 10 last for 1,000l. to Phillip Packer for repair of Audley End : same to be hereby satisfied by tallies on the Hearthmoney Contractors' payment due in Sept. next. Ibid, p. 499. The like on 1,670l. 2s. 6d. in further part of a same of July 15 last for 3,000l. to said Packer for the Works : to be hereby paid as above. Ibid. Report to the King from Treasurer Danby on a draft royal letter to the Lord Lieutenant of Ireland for the application of the sum of 1,413l. (unpaid upon the allowance of the Guards in Ireland for nine months from Lady day last to Christmas next) towards furnishing the Foot Guards there with arms and coats agreeable to the Yeomen of the Guard in England. "I cannot agree to the draught above written because it begets a new charge of cloathing which is not within the present establishment, and therefore ought to be first considered." Warrants not Relating to Money VII. p. 14. Mr. Best having lately seized 279 casks containing 13 tuns of brandy, it is desired if the seizure be discharged that the duty of Excise being 115l. may be first paid to the present Farmers of Excise. Caveat Book, p. 22. Charles Bertie to the Customs Cashier to bring in 500l. for half a year of the pension to Mary, Duchess of Richmond : "which you are to do with [due] respect to the weekly payments, but to prefer this before any others which are to be paid with respect to those payments [and] immediately after the Gent. and Grooms of the Bedchamber, Maids of Honour and Dressers : (and same to the Auditor of the Receipt to issue same). Money Book (General) p. 498. Same to same to bring in (when he has paid the Judges and other payments already directed) 250l. for the rent of Villiers house, to be issued to Mr. Lock as by the warrant of Oct. 2 last : (and same to the Auditor of the Receipt to pay same). Ibid. Royal warrant for a privy seal to secure the repayment of 50,000l. to be presently advanced and paid by Mr. Baker and partners upon a tally of loan into the Exchequer out of their [projected Excise Farm] rent. King's Warrant Book V. p. 244. Warrant from Treasurer Danby to the Attorney General to enter a noli prosequi against all indictments pending or hereafter to be brought by any person in the King's name against Hearthmoney officers touching the execution of their offices. Warrants not Relating to Money VII. p. 8. Same from same to the King's Remembrancer for a constat of the estate of Paul Williams, co. Middlesex, as by an inquisition lately made thereof, same having been thereby seized into the King's hand as escheated by the death of said Williams without heir. Ibid, p. 9b. Charles Bertie to the Customs Cashier to bring into the Exchequer (notwithstanding any former restriction) and same to the Auditor of the Receipt to issue 460l. for Mr. Rose, viz., 120l. for half a year to Sept. 29 last on his wages of 240l. per an. as Keeper of his Majesty's royal garden in St. James's park : 20l. for same half year on his fee of 40l. per an. ; 80l. to be paid to Mr. Packer for said Rose for payment of workmen for last Sept. 29 quarter ; and 240l. for charges in his said service for one year to Sept. 29 last. Money Book (General) p. 499. Same to same to bring in and same to same to issue 25l. for Mr. Hill, Keeper of Battles Walk in Windsor Forest, for half a year to June 24 last on his allowance of 50l. per an. for hay and wages. Ibid. Letter of direction on three orders for Bevil Skelton [as Envoy Extraordinary to the Emperor of Germany] viz., of the 24th inst, for 274l. for 274 days' additional allowance to Sept. 27 last ; of Oct. 4 last for 364l. for three months' ordinary to Sept. 27 last at 4l. a day ; and of the 10th inst. for 180l. for extraordinaries for last Sept. 29 quarter : same to be hereby paid by tallies on the Hearthmoney Contractors' payment due in March next. Ibid. 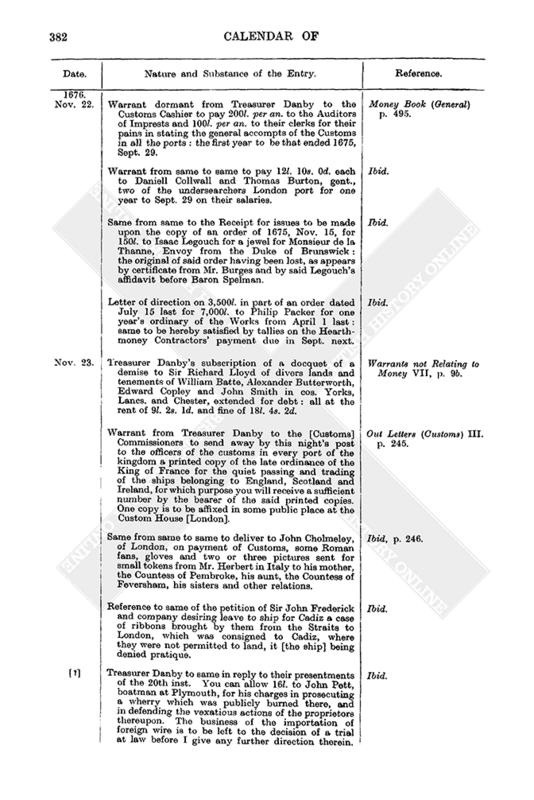 Warrant from Treasurer Danby to the Clerk of the Pipe for a lease to Bussy Mansell, of Briton Ferry, co. Glamorgan et al, of lands as in a schedule [missing] being lands of Sir Robert Thomas, and in trust for Dr. Butler, et al, ut supra, p. 142. Warrants not Relating to Money VII. pp. 21-2. Charles Bertie, dated from Wallingford House, to the Customs Commissioners conveying Treasurer Danby's instructions in reply to their presentments of the 20th inst. (1). The questions whether peruques shall go free, and whether the duty of Four and a Half per cent. at Barbados be payable on goods taken for the New Plantation duty are being referred to the Attorney General. (2). When Treasurer Danby directs any warrants to the King's Remembrancer or other officers of the Exchequer relating to the Customs he agrees that you shall have copies. (3). Mr. Pley, of Lyme, was to attend the Treasury on Monday, the 27th inst., "to adjust their debt." (4). 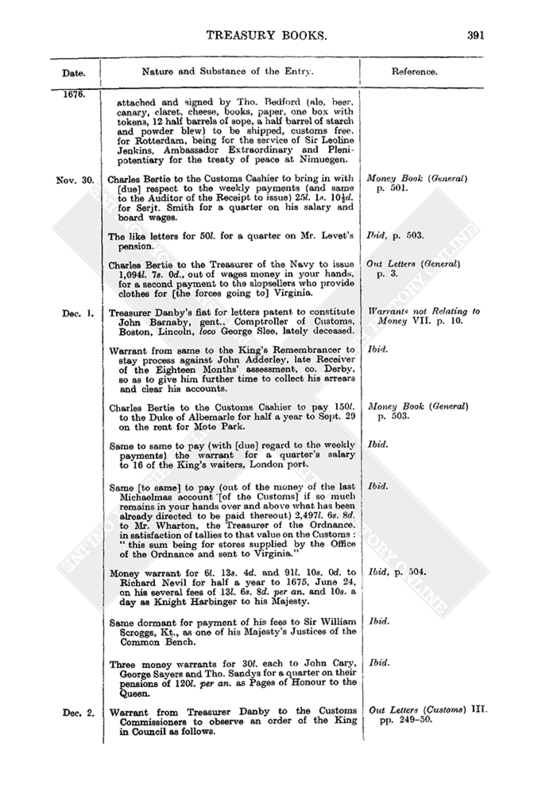 Enquire what commission Winne had to seize prohibited goods. (5) As to Mr. Hebdon's debt Charles Bertie is to attend Col. Whitley, his surety therein. (6). Treasurer Danby will discourse with Mr. Tregeagle and Mr. Courtney about the coinage and melting of tin and afterwards take further care therein. (7). On your presentments of the 27th inst. the matter of sending officers into Ireland and of appointing officers for New England is to be further considered. (8). The case of the Earl of Kinnoul about his farm of the duty of berilia and potashes is referred to the Attorney General. (9). The commission of Wynn and his partners for seizing prohibited goods is to be called in. (10). Treasurer Danby will shew the [form of a ship's] pass granted by the Lord Mayor of London since April 19 to the Lords Committees for Trade. (11) Pley and West are to attend next Monday. Out Letters (Customs) III. p. 247. Same to the Customs Cashier to bring in, with [due] regard to the weekly payments, and same to the Auditor of the Receipt to issue 37l. 10s. 0d. for Col. Gifford for last Michaelmas quarter on his pension of 150l. per an. Money Book (General) p. 500. The like letters as above for 50l. to Capt. Mansell for same quarter on his pension of 200l. per an. Money Book (General) p. 500. Charles Bertie to the Customs Cashier to bring in and same to the Auditor of the Receipt to issue 38l. to pay the remainder of Lord Frescheville's warrant of April 21 last for 76l. for half a year to Lady day last on his pension of 152l. per an. Ibid. Same to same to pay off (with [due] regard to the weekly payments) the money warrant of the 22nd inst. for 24l. to Mr. Colwall and Mr. Burton for one year's salary to Sept. 29 last. Ibid. Same to same to bring in, with [due] regard to the weekly payments, 875l. for the Earl of Bath and four Gentlemen of the Bedchamber ; 750l. for the 12 Grooms of the Bedchamber and 975l. for the Queen's 9 Dressers and 6 Maids of Honour. Ibid. Same for 75l. to Lady Wyche for a quarter as one of the Queen's Dressers. Ibid, p. 494. Warrant from Treasurer Danby to Tho. Newton the King's woodward general [of] and to the Regarders of the Forest of Whittlewood and Salcey. The Queen's Council is certified by the Lieutenant and Regarders of Salcey Forest and by the Deputy Lieutenant and Regarders of Whittlewood Forest that the following coppices are fit to be felled this season, viz., Knighton's coppice in Mr. Stirke's walk in Salcey Forest and Sandy Hurst coppice in Hazzleburgh walk and Cole's coppice in Shrobb walk and Beare coppice in Wakefield walk and a small spinny of about two acres near Syresham hatch in Whittlewood Forest. You are to fell sufficient trees for the gating, stileing, cabbening and staking of said coppices, selling the offal, etc., and accounting for same to the Auditor of Crown Revenues, co. Northampton. Warrants not Relating to Money VII. p. 9b. Privy seal to discharge Edward Progers, Esq. (one of the Grooms of the Bedchamber) as executor of Dame Briers Crofts (executrix of Sir John Crofts of Stow, co. Suffolk) of 1,095l. due from said Sir John for the dignity of a baronet. (Royal warrant dated Nov. 22 for said privy seal. Treasurer Danby's subscription dated Nov. 27 of docquet hereof. Treasurer Danby's warrant dated Dec. 1 hereon accordingly to the Receipt. King's Warrant Book V. pp. 249, 241. Docquet Book, p. 101. Money Book (General) p. 503. Royal warrant to the Attorney or Solicitor General for a great seal for a grant to Edward Bertie, Esq., uncle to Robert, Earl of Lindsey, Great Chamberlain of England, of the office of Collector of Customs and subsidies upon wool, leather, lead and tin and wool pelts or felts in London port : in as ample manner as enjoyed by Edward Brewer, or Thomas Bellor or any others. 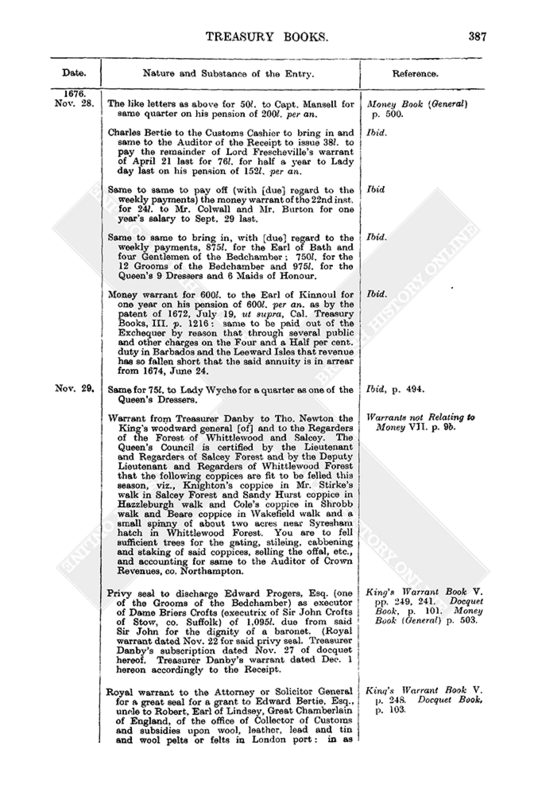 (Treasurer Danby's subscription dated Dec. 6 of docquet hereof.) King's Warrant Book V. p. 248. Docquet Book, p. 103. Privy seal for 10,000l. to Charles Bertie for secret service : without accompt, etc. (Royal warrant dated Nov. 17 for said privy seal. Treasurer Danby's subscription dated Nov. 27 of docquet hereof. Money warrant hereon dated Dec. 5.) King's Warrant Book V. pp. 249, 238. Docquet Book, p. 101. Money Book (General), p. 506. Warrant from Treasurer Danby to the Customs Commissioners to employ at the next vacancy Edward Lane as a land carriageman, London port, in consideration of his good service in the execution of a commission for seizing uncustomed and prohibited goods. Out Letters (Customs) III. p. 248. Instructions from same to same in reply to their representation of the 27th inst. (1). You are to repay to Thomas Cole, collector of Southampton port, 42l. 10s. 6d. which he formerly paid for the duty of some tobacco imported in the Joseph from Jersey, taking bond from the importer for payment thereof, against which bond a decree is lately made in the Exchequer "who have recommended unto me the said Cole for an allowance of the said sum as just and equitable." The Receiver General of Customs is to pay the [Customs] Solicitor's bill of charges (34l. 5s. 10d.) in prosecuting said bond and defending the suit commenced thereupon by said importers. (2). You are to insert in the establishment 10l. a year to Capt. Cox for cooperage for preserving wines brought into the King's cellars (so far as relates to his Majesty's service) : to commence from Sept. 29 last. The charge of cooperage so far as it relates to the merchants is to be borne by them for the future. (3). You are to pay 32l. 8s. 3d. (14l. 15s. 3d. to Henry Harling and 17l. 13s. 1d. 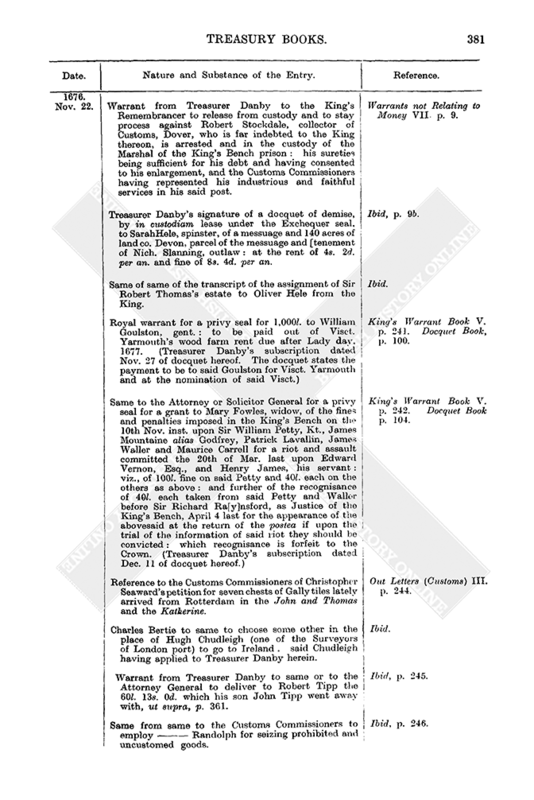 to the Customs Solicitor) for charges in prosecuting a seizure of gloves by direction of Treasurer Clifford although the verdict was given against the seizer on the late Act of Pardon. Ibid. 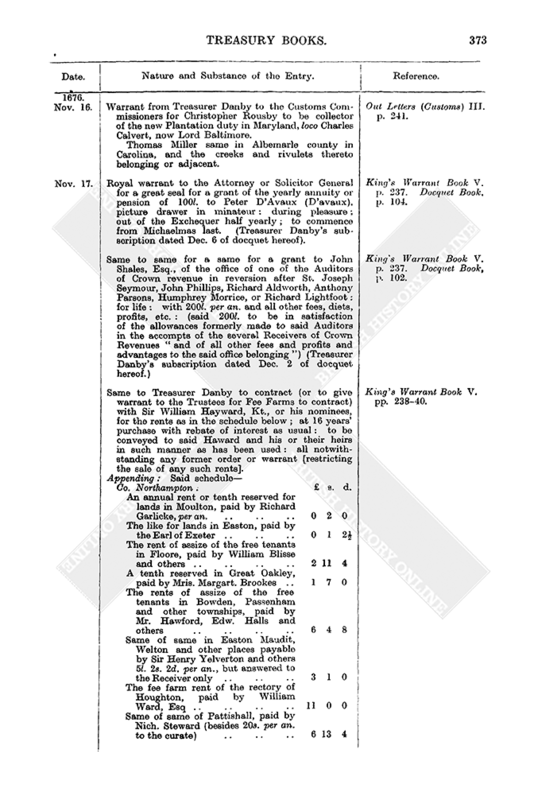 Warrant [from same to same] for a commission to James Irish to search for uncustomed and prohibited goods. Ibid, p. 249. 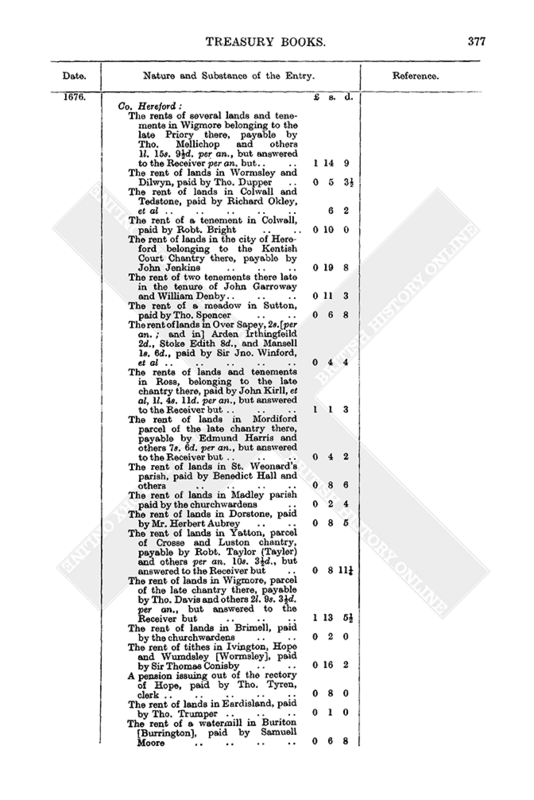 Same from same to same to employ William Shepherd as a tidesman at Newcastle, loco Richard Browne, deceased. Ibid. Charles Bertie to the Auditor of the Receipt to issue the 375l. which the Customs Cashier will bring in to the Earl of Bath for half a quarter on his pensions of 1,000l. and 2,000l. per an. payable at the Receipt as Groom of the Stole, etc. Money Book (General) p. 500. Same to the Customs Cashier to pay 250l. to the Earl of Bath for half a quarter on his pension of 2,000l. per an. on the Customs as Groom of the Stole, etc. Ibid. Same to [same] to pay 9,000l. to the Victuallers of the Navy upon tallies struck on you out of any money in your hands over and above the current weekly payments [charged on the Customs]. Ibid, p. 501. Charles Bertie to [the Customs Cashier] to bring in (when you shall have money to spare over and above the weekly payments) 300l. for Mr. Newport and Mr. Darcy for half a year on their salaries. (Same to the Auditor of the Receipt dated Dec. 5 to so issue same.) Money Book (General) p. 501. Same to same to pay the officers of the Pipe 464l. 6s. 4d. out of the receipt of the Customs in Jan. next. Ibid. Same to the Auditor of the Receipt (four letters) to pay 125l. each to the Earls of Ogle, Lindsey, Rochester and Suffolk for half a quarter as Gentlemen of the Bedchamber. Ibid. Same to the Customs Cashier (six letters) to pay 125l. each (having due regard to the weekly payments) to the Earls of Sunderland, Manchester, Ossory, Middlesex, Lord Gerard and the Duke of Albemarle for same as same. Ibid. Same to same to bring into the Exchequer ("when you pay in the Dressers' and Maids of Honours' money") 75l. for Madam Civett, 50l. for Lady Sanderson and 75l. for Lady Wych. Ibid. Same to the Auditor of the Receipt to issue 750l. to ten of the Queen's Dressers ; 300l. to the six Maids of Honour, 75l. to Madam Civett and 50l. to Lady Saunderson for a quarter on their pensions as by the late warrants for same. Ibid. Same to same to pay 62l. 10s. 0d. each to the 12 Grooms of the Bedchamber for half a quarter on their several pensions : in all 750l. which the Customs Cashier is to pay into the Exchequer for them. Ibid. Same to the Customs Cashier to bring into the Exchequer, with [due] respect to the weekly payments, 150l. for Lady Wych. Ibid. The like letter for 29l. 3s. 4d. to Andrew Lawrence as by the warrant of the 10th inst. (and same to the Auditor of the Receipt to issue same). Ibid, p. 502. Money warrant for 100l. 7s. 6d. to William Bishop, junr., Serjt. at Arms, for one year's salary and board wages. Ibid. Charles Bertie to the Auditor of the Receipt to pay 50l. 3s. 9d. each to Serjt. Williamson and Serjt. Bishop, junr., as soon as the Customs Cashier brings in money for them : to be for half a year's salary and board wages. Ibid. Money warrant for 75l. to Madam Civett for a quarter on her pension of 300l. per an. Ibid. Same for 500l. to Frances, Countess of Portland, for half a year to Sept. 29 last on her pension of 1,000l. per an. Ibid. Charles Bertie to the Auditor of the Receipt for tallies on the Excise (and same to the Receivers of Excise to pay said tallies) for 625l. 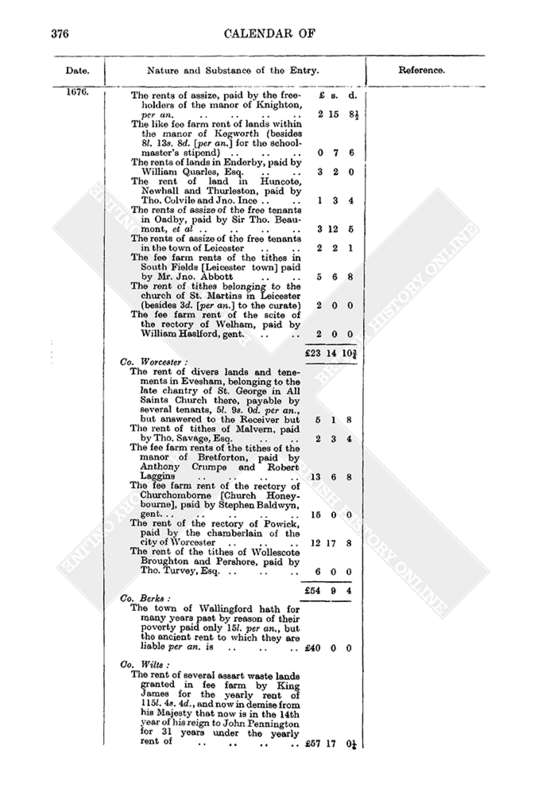 for a quarter on the Duke of Buckingham's pension of 2,500l. per an. Ibid. Warrant from Treasurer Danby to Sir John Fust, late sheriff of Gloucester (in accordance with the proclamation of 1661, Dec. 30, for discovery of robberies and burglaries) to pay 20l. to Nicholas Robinson of Winchcomb, co. Gloucester, wheelwright who (as appears by the certificate of William Stratford and Richard Baugh, two of the Justices of Peace for said county) did on the 7th Feb. last apprehend Thomas Sexton, junr., of Winchcomb, labourer, and prosecuted him to conviction, at the assizes at Gloucester, for burglary, and likewise on Mar. 20 last arrested Thomas Sexton, the elder, and similarly prosecuted him for burglary. Money Book (General) p. 502. Money warrant for 45l. 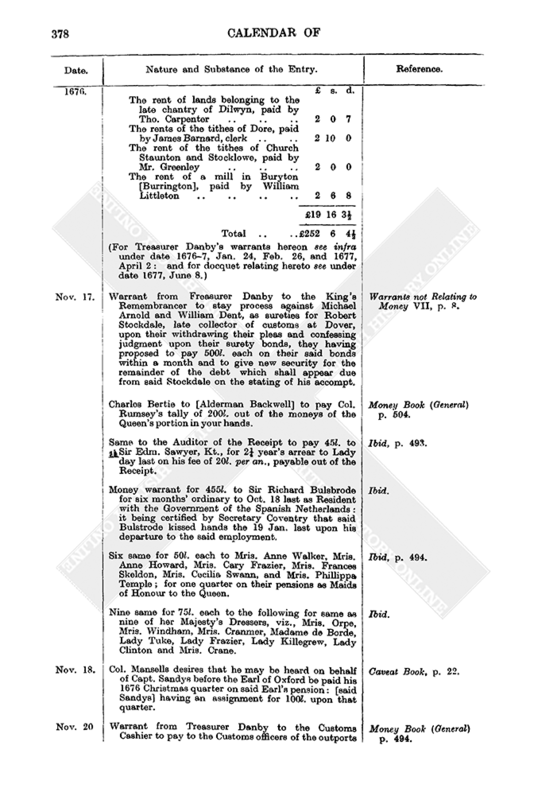 to the executors of Sir Edmund Sawyer for 2 years' arrears to Lady day last on his fee of 20l. per an. as late an auditor of the revenue. Ibid. Letter of direction on an order of the 8th inst. for 366l. to William Perwich for 183 days' ordinary to Lady day last : same to be hereby satisfied by tallies on the Hearthmoney Contractors' payment due in March next. Ibid, p. 503. Charles Bertie to the Customs Cashier to bring in (as soon as you have satisfied the weekly payments) and same to the Auditor of the Receipt to issue 15l. to the vicars [choral] and subchanters of Lichfield Cathedral for one year to Sept. 29 last on their perpetuity : and 10l. to the Dean and Chapter there for same to June 24 last on same. Ibid. Same to same to pay in, with [due] respect to the current weekly payments (and same to the Auditor of the Receipt to issue) 500l. to Sir Thomas Williams upon an order in his name. Ibid, p. 504. Privy seal authorising and directing the Treasury to order the Receiver or Receivers General of the fines, penalties and forfeitures on offenders against the Conventicle Act or the persons in whose hands said fines, etc., shall from time to time remain, to pay and dispose of the King's share thereof actually levied since 1670-1, Mar. 15, to such persons and uses and in such manner as the King shall direct by warrant under his royal sign manual : and in case any such fines since said date have been paid into the Exchequer and now remain there or shall be brought thither then that same be kept distinct and apart from all other the King's revenue thereof and thereof issues to be made from time to time as the King shall direct by warrant under his royal sign manual. (Royal warrant dated Nov. 8 to the Clerk of the Signet for said privy seal. Treasurer Danby's subscription dated Nov. 27 of docquet hereof.) King's Warrant Book V. pp. 250-1, 235. Docquet Book, p. 101. Same for 38,000l. to Baptist May, Keeper of the Privy Purse, for the use of the Privy Purse : without account. (Royal warrant dated Nov. 20 for said privy seal. Treasurer Danby's subscription dated Nov. 29 of docquet hereof.) King's Warrant Book V. pp. 324, 241. Docquet Book. p. 103. Warrant from Treasurer Danby to the Customs Commissioners to permit particulars as in a schedule attached and signed by Tho. Bedford (ale, beer, canary, claret, cheese, books, paper, one box with tokens, 12 half barrels of sope, a half barrel of starch and powder blew) to be shipped, customs free, for Rotterdam, being for the service of Sir Leoline Jenkins, Ambassador Extraordinary and Plenipotentiary for the treaty of peace at Nimuegen. Out Letters (Customs) III. p. 249. Charles Bertie to the Customs Cashier to bring in with [due] respect to the weekly payments (and same to the Auditor of the Receipt to issue) 25l. 1s. 10d. for Serjt. Smith for a quarter on his salary and board wages. Money Book (General) p. 501. The like letters for 50l. for a quarter on Mr. Levet's pension. Ibid, p. 503. Charles Bertie to the Treasurer of the Navy to issue 1,094l. 7s. 0d., out of wages money in your hands, for a second payment to the slopsellers who provide clothes for [the forces going to] Virginia. Out Letters (General) p. 3.